"3LA1, V-2005" by Timothy K. Perttula and Robert Z. Selden Jr. CONTEXT INFORMATION: From Burial 4 in Burial Plot 2 (Martin 1939), in association with V-2006 and pipes P-238 and P-239. DECORATION: The rim panel on this vessel has two horizontal interlocking engraved-punctated scrolls; the underside of the folded lip is a row of punctations, and there is a second row of punctations at the carination point. The interlocking scroll has a central narrow engraved band filled with punctations, opposed single hooked arm engraved lines that partially encircle the central horizontal scroll band, and two attached engraved-punctated brackets that extend from the central band to the rim or the carination. Between each of these sets of brackets is a small engraved rectangle. The two horizontal interlocking scrolls are separated from each other by two sets of two vertical engraved and punctate-filled brackets that extend from the rim to the vessel carination. Between each of these sets is a single vertically-oriented engraved rectangle. 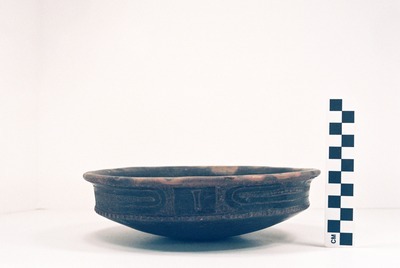 Handy Engraved carinated bowl (5425-675): a, photograph; b, drawing by Bobby Gonzalez.